Servicing time - Approximately 3-4 weeks from arrival at Clippersharp. Please ring 01823 681076 if you require any further updates or timings whilst your clippers are with us. Need your blades sharpened too? Simply include them in with your clippers when you send them for servicing. If you just need your clipper blades/scissors sharpened, please click here. 1. CHECK that we can service your particular make of clippers. If you can’t see your brand on the list, do give us a call before sending your clippers to check if it’s something we can do. 2. 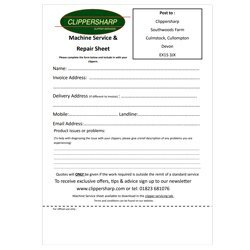 TELL US if you have had any problems with your clippers when you fill in your service form. We will also need your contact details. If you require a quote before work goes ahead on your clippers please make this clear on the service form. 3. PACK your clippers well to protect them in transit. If your clippers have a plastic carry case, do send them in the case, with bubble wrap or other padding around the case itself. Otherwise pack well in a strong cardboard box. REMEMBER to include the charger and battery if you are sending a battery powered machine. 5. SEND your parcel with a reputable courier. Customers have had problems with myHermes in the past when sending clippers and suggest using an alternative if possible. Battery powered machines MUST be sent using a courier. We recommend using UKMail who will accept all batteries that are being collected and delivered within the UK. Mains powered machines can be posted using Royal Mail by taking them to your local post office. We recommend sending them using a Tracked and/or signed for service. 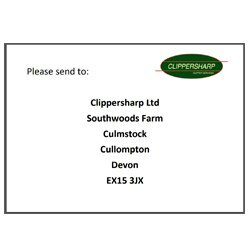 Clippersharp Ltd., Southwoods Farm, Culmstock, Cullompton, Devon EX15 3JX. Include your own ‘senders address’, just in case there is problem in transit. Click on the image to download and print a label. Our going rate for return courier delivery is currently £9.50 for all machines. Once the work is complete, we will contact you by phone or email. ONLINE INVOICE - we will need your email address for this, you will then be able to pay your outstanding invoice by entering the quote reference number we give you here. TELEPHONE If you would prefer to pay by telephone, we will be in contact when the work is complete to take card payment details. BACS Payments can also be made by bank transfer - just let us know how you'd like to pay. When your clippers arrive, they are booked in; the contents of your parcel is listed and the date of arrival is noted. We do not provide notification of receipt. Once at the front of the queue, they will be taken into the workshop and examined by the engineer. If requested, a quote will be provided by telephone (on the condition that the work required is outside the remit of a standard service).